The Intrepid Sea, Air and Space Museum is an American military and maritime history museum showcasing a collection of ships, air and space craft. These include the aircraft carrier Intrepid, the nuclear missile submarine USS Growler and the space shuttle Enterprise. The museum – located on Manhattan’s West Side on the Hudson River – also features a host of interactive educational programs and exhibits. Art Guild’s past work for the museum includes a project on-board the USS Growler, a diesel-powered attack sub converted to carry the guided Regulus 1 nuclear missile. Our most recent project – an iWall for the museum’s visitor center – stars the Regulus 1 missile itself. The Regulus 1 showcased by our new iWall is the Navy’s first operational cruise missile – conceived in 1947 by the Chance Vought Aircraft Division of the United Aircraft Corporation – and long since replaced by the Polaris program. 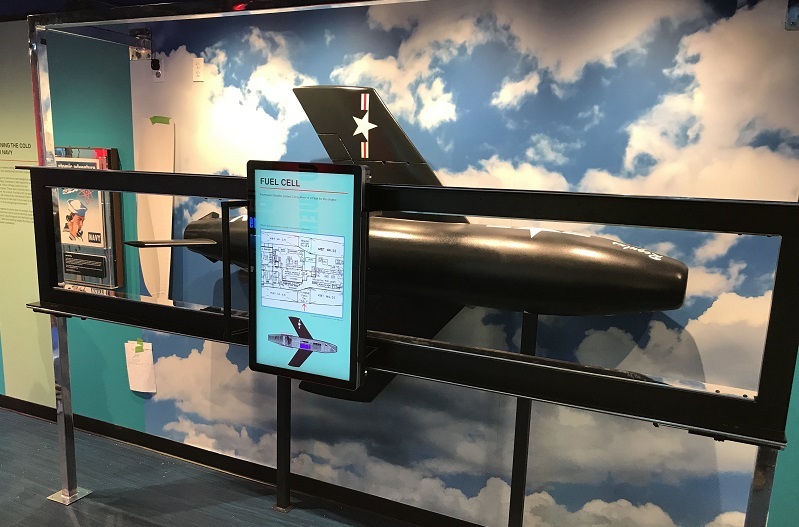 The iWall designed and built by Art Guild – with content supplied by our partner Perfect Prototype – allows visitors to get a detailed look inside the missile, exploring its history and all its inner workings from propulsion system to warhead. See the slideshow above for images of both the iWall and the Intrepid Sea, Air and Space Museum including an actual, unarmed Regulus missile mounted on the deck of the Growler. You can see a short video of the Regulus iWall at work here.